Tyre test on video | What Car? Cheap rubber might be easy on your wallet, but is it really worth the saving? We tested a selection of budget tyres against three premium brands to find out. Pop in to your local tyre fitter and youll have the choice of dozens of brands. Some will be expensive up to 100 each, including fitting, for a basic Ford Focus or VW Golf while others seem a snip at half the price. There cant be that much difference in performance, can there? 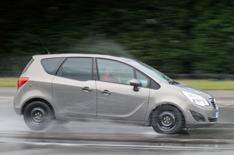 We pitted three premium tyres against three budget alternatives in a series of braking tests, and the results were shocking. In the wet, the budget tyres took an average of 14 metres the length of an articulated lorry longer than the premium tyres to pull up from 70mph.